Moles & Skin Tags: The Solution! Unevenness in skin attracts critical attention. Naturally, everyone is very careful about the health and look of skin. Dry and oily skin, pimple and acnes, tanning and glow – all of these can be managed with some care. But when you feel ‘stained’ with something more permanent – like moles and skin tags – there’s not much you can on your own. However, moles and skin tags can be easily removed with a cosmetic surgery. How? Moles are a growth on your skin, usually black or dark brown in colour. They are mostly harmless. However, any sudden change in the colour, size, texture of a mole is abnormal and should be checked out by an expert. 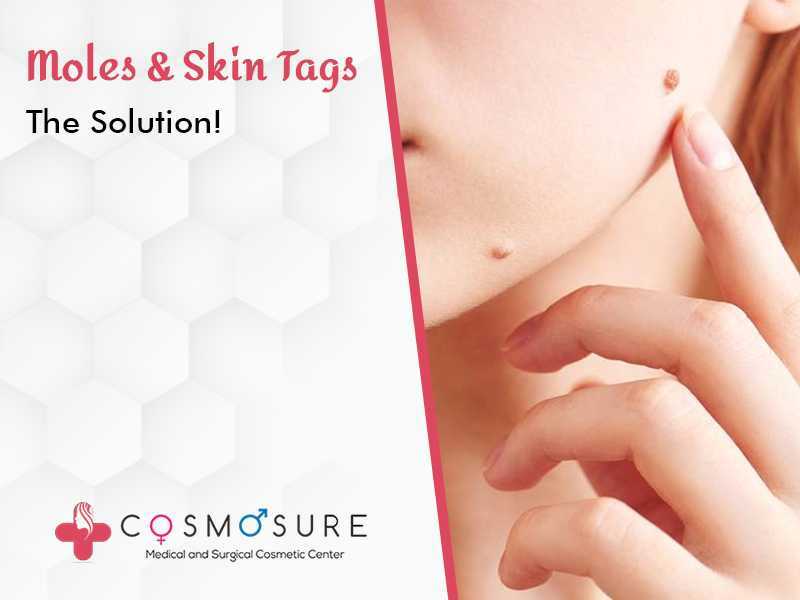 Skin tags are excess chunk of skin tissue that protrudes or hangs from the skin. They can be seen in areas like neck, chest, underarms, breasts, groin etc. They do not pose any health risk but lowers the aesthetic outlook of the skin. Both moles and skin tags can be present by birth or can develop later. Some of them even blend with the skin over time. But the ones which do not can be removed through cosmetic procedures. How Are Skin Tags and Moles Removed? The procedure of removal of either a skin tag or a mole depends on various factors – like the size, location and texture. But all these procedures are done on an outpatient basis and only local anaesthesia is used, if required. Snipping: This is the easiest way to remove a small skin tag. During this procedure, the doctor ‘snips’ or cuts out the excess skin using surgical scissors. It gives nearly immediate results. Freezing: Freezing, also known as cryotherapy, used cold compression to dry out the tag which eventually falls off. For this procedures, extremely cold liquid nitrogen is used for one to two weeks. Burning: An electric current dries out the skin that tags out of your skin. This causes it to fall off. Skin tag removal is generally a permanent solution. Once a tag is removed from a place, it’s unlikely that a new one will grow in the same place. Laser Treatment: A ray of light, whose wavelength is adjusted as required, is used to wipe out the mole. Depending on the size of the mole, a few sittings may be required. It should be done only by an experienced cosmetic surgeon as a faulty laser ray can burn the skin. Surgical Shave: A tiny mole can be removed by using a specialised blade to shave of the blemished area. No stitches are required in this procedure and you heal very fast. Scalpel Excision: In this procedure, you will receive a dose of anaesthesia first which will numb the mole area. Then the surgeon uses a sharp blade to scrape out the mole. The cut is then stitched closed. This technique is used to erase bigger moles. This generally leaves a faint/small scar.In case of very big moles, an additional skin graft may be recommended. Punch Technique: If a mole is small in look but the blemish extends deep inside the skin, a punch technique can be used. Just like the same suggests, it will punch out a cylindrical chunk of tissues removing the existing mole. Non-cancerous, or regular moles do not come back once removed. However, treatment or removal of cancerous moles can be hugely different. This is why, before deciding on any of the treatment options, your surgeon is likely to test (physically and through diagnostic tests) the health condition of the mole or skin tag. Can You Remove A Mole At Home? You must not remove a mole by yourself. While the procedure might sound simple, if you try it at home, you could risk a higher extent of scarring in addition to risking excessive blood loss, infection and even nerve damage. Only an expert can perform a mole or skin tag removal surgery. How To Recover After A Mole Or Skin Tag Removal Surgery? Keep the area (and incisions, if any) dry and away from sunlight. Watch out for infection or any other abnormality. Do not miss the follow ups with your doctor if advised so. If you had stitches, you may have to get them removed after a week or so. Moles and skin tags removal is mostly done for aesthetic purposes. And they can be easily removed using these cosmetic procedures. These treatments offer a quick, efficient and permanent solution. If you have a ‘displeasing’ mole, you can talk to our experts to find your solution.